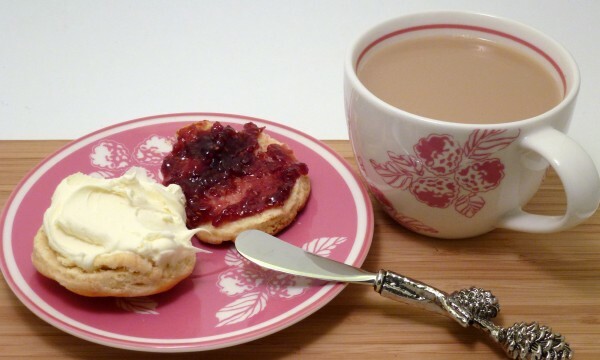 Scones are one of the best foods the UK has to offer. I really wish Canadians were a tad more enthusiastic about afternoon tea (with scones and mini cucumber sandwiches.) It just isn’t done enough here. Canada is also falling short with its supply of clotted cream. I realize that many Canadians have never heard of clotted cream, and let’s face it, clotted cream doesn’t sound too appealing to those who have never experienced it. Clotted cream (aka Devonshire cream) is hardly sold anywhere in Canada (as far as I know, it is only sold in specialty stores.) It is usually served with scones for afternoon tea in the UK… and oh it is addictive. Since I am no longer in the UK and no longer have easy-access to clotted cream, I used mascarpone instead, which is similar in taste and equally as delicious. This is adapted from my Nana’s recipe (she is Welsh so it is a good one.) Scones are very easy to make, but the trick is to keep the butter very very cold. You can also replace some of the butter in this recipe with vegetable shortening. Shortening has a higher melting point than butter, and as a result, will often give a better texture in scones (and pie crusts) than butter can. On the other hand, butter offers a much, much better flavour. Cut in butter to get a bread crumb like texture. 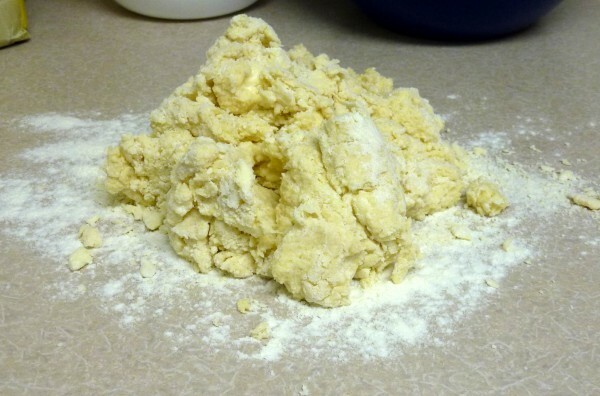 Place flour/butter in the freezer to ensure the butter is as cold as possible before mixing in liquid. Beat egg and mix with milk. Slowly add milk/egg mixture, while mixing with fork. Only add enough liquid for the dough to be SLIGHTLY TACKY, NOT STICKY! If dough is too dry, add more milk. Turn dough onto a lightly floured surface and knead 10 times. Roll out dough (approx 1 inch thick) and cut into rounds with a cookie cutter. Place on baking tray and brush with egg wash.
Bake at 400 F (200 C) for 10-12 minutes. Serve with jam/clotted cream and tea! 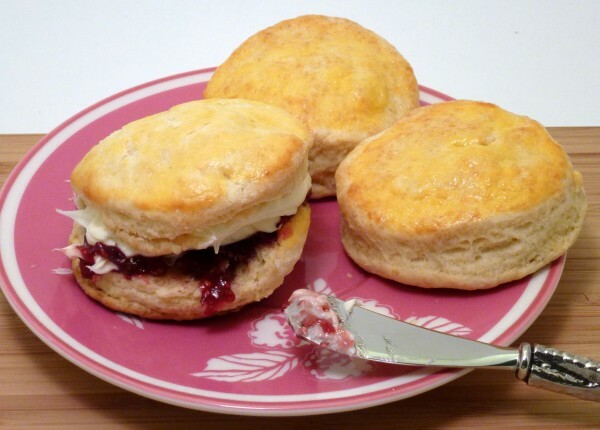 Now before I wrap up this post, I would like to ask, how do you pronounce the word scone? I grew up saying scone to rhyme with cone. However, in Scotland everyone pronounces it “skon.” This brought up a debate once with some coworkers. Some would argue that the first way is correct because it is like the word cone with an “s” on the front of it. Others argued that it should rhyme with gone. What do you think?